We interrupt this two part series with a not so important news bulletin. 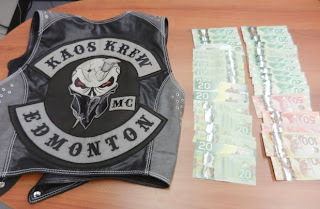 The Edmonton Journal is reporting that Peter Goodsell, who police claim is a member of the Hells Angels puppet club Kaos Krew was arrested after a traffic stop in Spruce Grove that netted marijuana, cocaine, cash and a large knife. It was only three ounces of marijuana and about 35-40 grams of cocaine but the cocaine was divided into 30 bags for reselling which would imply trafficking.